While Venice grew into a maritime power at the head of the Adriatic Sea, on the opposite coast of the Italian peninsula Genoa emerged as the maritime power of the Ligurian Sea and later of the Tyrrhenian Sea as well. 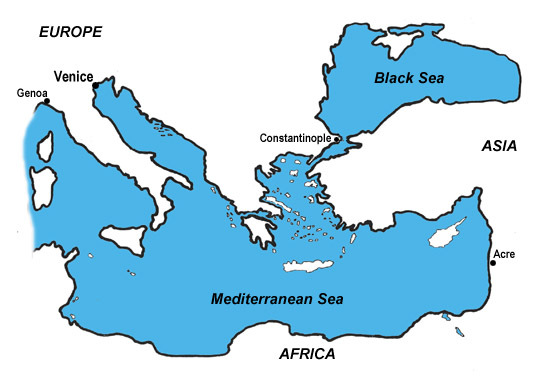 In the 1100s and 1200s, as Venice and Genoa began to project their power beyond their home waters and into the trade routes of the eastern Mediterranean, their interests began increasingly to clash. A seesaw struggle for influence and exclusivity in various markets, such as Constantinople and Acre, erupted in periodic violence between naval forces of the two cities. Finally, their commercial rivalry in the East led them into four exhausting and ultimately inconclusive wars over a period of 125 years. The last of the wars reached its climax in the Venetian lagoon itself and -- until a dramatic reversal of fortune -- threatened the life of the Venetian Republic. The first two Genoese Wars (1255-1270, 1294-9) produced naval victories for each side in an almost random pattern. On balance, the first war favored the Venetians and the second the Genoese. Fifty years of relative peace ensued, the belligerants heavily occupied by other challenges, including awesome onslaughts of plague. The Third Genoese War (1351-5) began well for the Venetians but ended badly. Control of the Genoa government, however, had passed to the Visconti family of Milan, and Venice was able to negotiate a better peace treaty than its military posture would have suggested. From one point of view the Fourth Genoese War (1378-81), called the War of Chioggia, can be viewed as a defeat for the Venetians, but Venice's dramatic and climactic victory at Chioggia, 1379-80, pulled defeat from the jaws of complete disaster.